Opponents of a constitutional convention want you to believe that empowering the people would be scary. Editor’s note: Today Civil Beat welcomes its newest columnist, Danny de Gracia. Born in Guam and raised in Hawaii, he’s a longtime observer of public life in the islands who’s worked both sides of the political aisle. 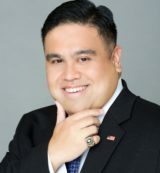 The Waipahu resident holds doctoral degrees in theology and ministry and a master’s degree in political science. A former contributor to the Washington Times, he hopes to bring a solutions-oriented approach to the political and cultural issues he writes about. Hawaii’s greatest fear isn’t nuclear attack by North Korea or a 200-foot killer tsunami washing up on Oahu’s southern shores. We can handle missile alerts, volcanoes, Category 5 hurricanes, even a Zipper Lane breaking down. If you really want to put terror in the heart of our state, one only needs to suggest change in the form of a constitutional convention. The last time Hawaii had a ConCon, Jimmy Carter was president, “Copacabana” by Barry Manilow was hot on the charts, and a new home in the islands cost as little as $63,000. 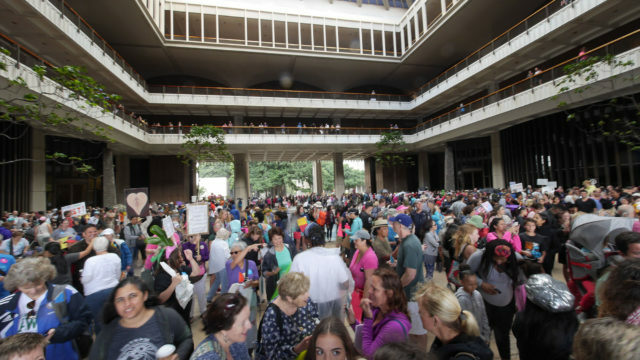 People fill the rotunda of the Hawaii Capitol during the Women’s March in January 2017. Are the folks upstairs the only ones we can trust to propose new laws? So many things have drastically changed in our world and cultural consciousness since 1978, but since then Hawaii voters, deterred by lobbyist imprecations of woe and politico prophecies of doom if we open the sealed scroll of the state constitution, have opted to leave well enough alone when it comes to the document at the heart of our government. With Halloween right around the corner, just how scary is a ConCon? So scary that supposedly voters shouldn’t even approve holding one, let alone elect delegates, because only staffers of legislators, pawns of special interest groups and the chosen ones of mega-corporations will get elected. Basically, we’re under threat of being represented by the people who already represent us. Then there’s the frightening possibility that a ConCon might mess things up by forsaking the natural environment, depriving public workers of a fair salary, and committing our state to useless, even contradictory mandates. But since we’ve already messed up Hawaii by doing all those things in spades, the good news is things can only go up from rock bottom. Hyperbole aside, Hawaii’s people deserve the right to revisit our social contract. Behind wagging fingers warning us off from a ConCon is a paternalistic belief that political elites somehow know what’s best. Some may call that practice “good government” but I call it helicopter legislating. Hawaii doesn’t need someone to hover over us and tell us we’re not mature enough to decide what makes us safe or happy. Government derives its just power from the consent of the governed, and whenever any form of government becomes destructive of these ends, it is the right of the people to alter or abolish it. We have tools at our disposal that make human democracy more connected, informed and powerful than ever before. Democracy has always been an experiment, and experiments are often messy, just like real life is unpredictable. But without courage, there can be no change; without change, there can be no future. Everything in nature that does not change is subject to extinction, because adaptation is essential to evolution. As citizens of the Brainware Era, Hawaii residents are far too intelligent, honorable and precious to be denied the right to write the plan of the next millennium in the form of a ConCon. We have tools at our disposal that make human democracy more connected, informed and powerful than ever before. An 18-year-old with a laptop and an internet connection wields the power to touch the hearts of an entire planet, a feat that could never have happened in 1978, 1968, or even 1776. In this incredible epoch where technology, humanity and destiny intersect in a sacred geometry of opportunity for us all, it’s time for voters to recognize nothing is impossible for Hawaii residents who believe. As a new columnist with Civil Beat, in the days to come I invite readers to join me in an exploration of what we can do when we all start talking, listening and dreaming together again. I’ve been in Hawaii politics and policymaking since 2006, when I first worked for the state House of Representatives as the lead committee clerk for Human Services. I’ve served under Democrats and Republicans alike, worked in the state civil service, joined a union, and even been an alternate delegate to a Republican National Convention. I’m a political scientist, and I’m also a theologist. I’ve worn many hats and held many titles over the years, and I have proudly been all things to all people, but the most important title I have ever held is to be called a resident of Hawaii, a place where the greatest people on Earth can be found. Hawaii has always been where talking story and respect have brought together diverse people of vastly different backgrounds from all around the world. But lately, things haven’t been quite the same. Here in our islands and across America, we’ve been shouting more than we listen, and retreating to stereotypes and fear rather than understanding and respect. This is something that I hope to change in my column, as we ask questions, share discoveries, and learn once more that the best system of government is one that works for everyone, not just a few. As we begin this journey, I’m reminded of an Air Force pilot by the name of Heather Penney, who, on the morning of the terrible attacks on Sept. 11, 2001, was rushed into the air with no weapons to intercept a rogue airliner. Penney and her wingman were ordered to stop Flight 93, if necessary using their F-16s to ram the airliner nose and tail as manned missiles. Ultimately, Penney was spared that sacrifice as the passengers of Flight 93 took control and saved Washington, D.C., from attack. Democracy begins with a courageous choice. Let’s find out what’s possible together, again. My name is Danny de Gracia, and let’s #BeCivil. Danny de Gracia is a resident of Waipahu, a political scientist, a proud union shop steward, and an ordained minister. Opinions are the author's own and do not necessarily reflect Civil Beat's views.